Farming Foible, or an Agrarian Adventure? 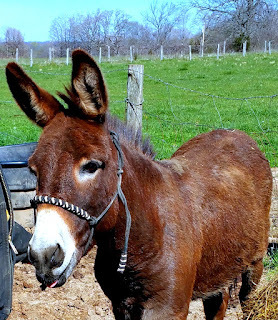 : How to Accidentally Adopt a Donkey in 18 Easy to Follow Steps! How to Accidentally Adopt a Donkey in 18 Easy to Follow Steps! Would you like to know how to accidentally adopt a donkey in 18 easy to follow steps? 1.) Make a friend in Mississippi by bonding over your shared love of horses. 2.) Move back to Illinois and live your life. 3.) Stalk her Facebook page randomly and see that she has moved to Oklahoma and is asking about fence recommendations. 4.) Give her fence recommendations, ‘cause you know, you’re a freaking BOSS when it comes to fencing recommendations. 5.) This causes her posts to show up in your newsfeed so you see that she is rescuing a donkey. 6.) Think that that is cool and follow her progress with the donkey regularly. 7.) See that the donkey has bitten the hell out of her and she wants to put him down. 9.) Call her to try to talk her into giving him another chance. 10.) Realize an hour later that you just agreed to take the donkey. 12.) Convince your boyfriend to house a very bitey little stud donkey (which are called Jacks), because the cows need a guardian to protect them from coyotes. 13.) Congratulate yourself on your clever ruse. 14.) Sing Dominick the Donkey, the Merry Christmas Donkey repeatedly for at least a week. 15.) Consider learning to drive a trailer just so you can go get your new donkey friend, who may or may not be possessed. 17.) Pay someone to pick up and haul the donkey. 18.) Fall in love with Dominick, your newly adopted donkey. Sing it with me now! Our brand new little donkey. La la la-la la-la la-ee-oh-da! And now we have a little friend, his name is Dominick. A bitey little donkey, he will sometimes even kick. When you come to the V-Y, With Dominick you'll be. Because I could not say no, to adopting a donkey!